We have had lots of fun checking out the best dog beds for labs and other large breeds. We’ve found fancy beds and practical beds. Beds for old dogs, beds for really big dogs. Extra special beds and beds that won’t make your wallet weep. 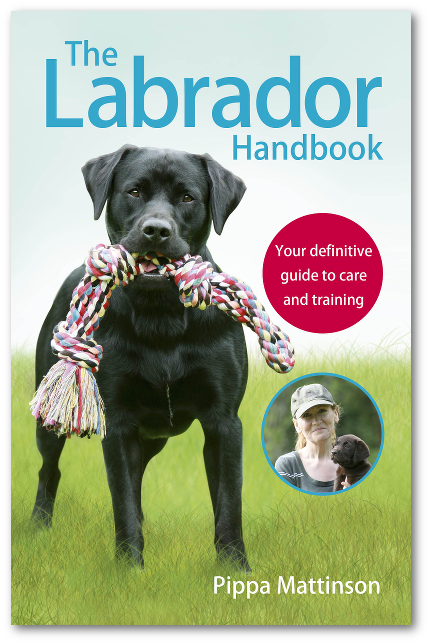 We’ll also update this page regularly with the top choice made by other Labrador Site readers! 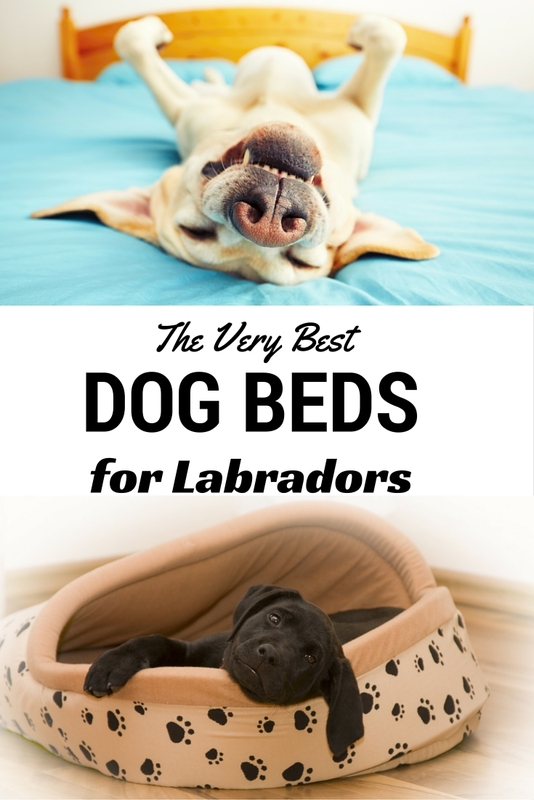 There’s something here for every Lab, and some fab ideas to help you find the best dog beds for your family. Don’t forget, although some of these beds are quite tough, no soft dog bed will stand up to a determined chewer. If your Labrador is a known bed eater, it may be worth waiting until they are past this phase before spending a lot of money on a luxury bed. Most pups will grow out of extreme chewing by the time they are a couple of years old, although some do persist longer. Whilst you wait, check out the plastic dog bed shown below. Whether you are looking for a touch of luxury or something affordable, we have got lots of great options for you to choose from. A great way to start choosing your dog bed is to check out what other dog owners have been selecting. Let’s start by looking at the best selling dog beds suited to large breeds on Amazon at the moment. The FurHaven NAP Pet Bed is a lovely dog bed, that comes in a couple of color options. A luxuriously soft faux fur sleeping layer is very soft and your dog will love settling down onto it. The base of the mattress is orthopedic in design, giving support and comfort to your dog’s body as he rests. The cover is removable and machine washable, allowing you to keep it fresh and clean. You can even hand wash the foam core occasionally to help keep the bed fresh. It comes in a Jumbo size, perfect for even the biggest, stretching Labs! Find out more about the FurHaven NAP Pet Bed here. The Ombre Swirl dog bed comes in a range of sizes up to 48 inches, and will suit any Labrador build well. It can be used as a stand alone bed or will fit nicely into most designs of extra large dog crate. This lovely bed comes in a range of colors with a pretty swirl pattern. 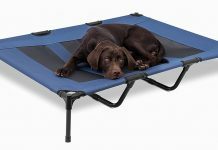 It even has a great non-skid base, to keep it in place on your floor when your dog climbs on and settles. The bed is easy to maintain, being machine washable and coming with a year long warranty from the manufacturer. Check out the Ombre Swirl Dog Bed here. The PetFusion Ultimate Pet Bed and Lounge is a great choice for a larger breed. The mattress is 4 inches of memory foam, giving a very comfortable, supportive surface. A smart design ensures that the cover is water and tear resistant, with a non-skid base. You can check out the PetFusion Ultimate Pet Bed & Lounge here. The Amazon Basics Padded Pet Bolster Bed has a comfy polyester cushion, covered with a soft fleece cover. It is machine washable so can stay looking fresh. This bolster bed is ideal for Labs who sleep in a crate as it comes in these set floor sizes, and has a comfortable raised rim around the edge for them to rest against. You can find out more about the Padded Pet Bolster Bed here. Another great padded bed that works well as a dog bed or crate mat is the MidWest Quiet Deluxe Micro Terry Bed. It comes in an even bigger range of sizes, and up to a very large 48 inches long. Great for even the biggest Labrador. This pet bed is designed to be warm in winter as well as cool in summer. It is completely machine washable and should provide a soft and snug place for your dog to relax. Check out the MidWest Quiet Deluxe Micro Terry Bed here. The Serta Quilted Pillowtop is an orthopedic, extra large dog bed. Orthopaedic beds are great for older dogs or those with joint problems like hip dysplasia or arthritis. The quality is high and it will look good in any home. Find out more about the Serta Quilted Orthopedic Pillowtop Dog Bed here. 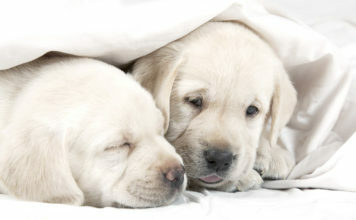 Our beloved Labs tend to be large, and their beds are a prominent part of the home. Finding them a dog bed that isn’t just cosy and comfortable, but also looks good and is built to last is a big priority for a lot of families. The Luxury Overstuffed Sofa is exactly what the name suggests! This gorgeous luxury dog bed is a sofa and comfortable sofa just for your dog. It is very padded, with a microsuede fabric cover. The covers are even machine washable and tumble drier friendly. So you can keep it looking as good as the day it arrived. This sofa comes in a range of sizes, and depending upon how big your dog is you will either want the large or extra large options. Why not find out more about this gorgeous cosy nest here. The Suede Bagel dog bed is designed with your dog’s comfort in mind, but also your convenience. It has a heavy duty waterproof base, and is covered in a durable faux suede. Although this dog bed is machine washable, do be aware that it is large and therefore might be a squeeze to get into some smaller machines. 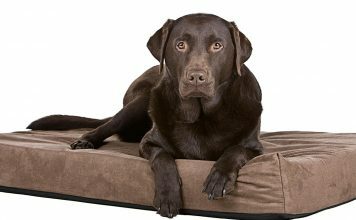 This luxury dog bed comes in a range of sizes and you will probably want to pick the largest option for the average Lab. It is also available in a range of colours, so you can again pick whichever one you think will match your home and dog best! You can check it out for yourself by following this link. We love the look of the Dog Lounge. 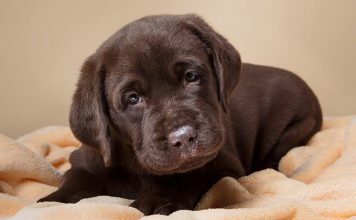 In fact, I am very tempted to get one of these for our chocolate Labrador! The Dog Lounge and Bed looks amazing, and has hundreds of positive reviews to back up it’s claims. The base consists of a four inch memory foam mattress. This gives your dog a huge amount of comfort and support. It is also of a durable, anti-tear construction, with a non-skid bottom. The covers are easily removable and machine washable. And it’s designed to support even the biggest, Labrador or Lab cross. You can find out more about this very appealing bed here. 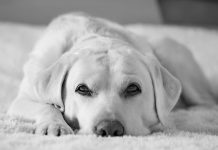 Large dog beds can come with large price tags, and as much as we’d all like to splash out on something fancy for our Labs this just isn’t always possible. 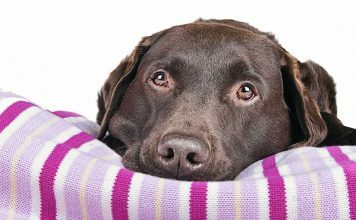 So we have put together a few selections of cheap dog beds which your Labrador will love, without breaking the bank. The Super Value pet bed is a large pillow dog bed. It has ample size to fit a fully grown Lab. It also comes in a range of fun colours. Our favourite is the purple one pictured here with a Dalmatian modelling. It’s cover is machine washable, and it should keep your dog comfy and cosy too. You can find out more about the super value dog bed here. When dogs age it is not uncommon for them to become arthritic and need a bit more support from their beds. 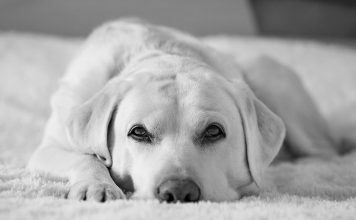 Labradors as a breed are also sadly fairly frequently affected by hip and elbow dysplasia, which can benefit from added support when laying down. Any dog who has aches and pains in their joints, or just not a lot of meat on their bones, could benefit from an orthopedic dog bed. Fortunately, there are some really good quality orthopedic dog beds available for you to select from. The Gel Memory Foam orthopedic dog bed is designed to provide therapeutic support to dogs suffering from joint pain. It also has a waterproof liner to protect it from dirt, water and any little accidents that might befall it. The gel memory foam has the added benefit of not only give comfort and support to your dogs joints, but providing a cooling layer. If your dog suffers from arthritis or hip dysplasia, this is a bed that is designed with him in mind. You can get more information on the gel memory foam mattress here. The Premium Orthopedic Memory Foam Dog Mattress was built with durability in mind. It’s therapeutic memory foam padded base is secured in a denim cover that is designed to be easy to clean and very long lasting. You even get a spare cover, so you don’t have to keep your dog away from his bed whilst one is in the wash. The bed is heavy duty and offers a great deal of support. You can get the replacement covers in a range of colours to suit your home and dog. To find out more about this orthopedic dog bed visit this page. A raised dog bed is a great choice for some Labradors. Not only do they help to keep them cool, but they can be used both inside and outside. 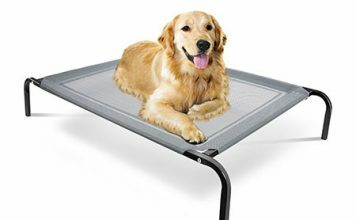 If you are looking for an outdoor dog bed then an elevated bed is a great choice. The best way to keep your dog cool seems to be to give him an elevated dog bed. The Coolaroo Elevated Ped Bed is a big hit. With over 5,000 reviews on Amazon, most of which are 5 stars, you know you are onto a safe bet. It comes in a range of sizes and colours, to fit you and your dog’s own requirements. The knitted fabric provides a durable but comfortable layer for your dog to lay on, and the strong steel from is even portable. Ideal for keeping your dog cool in the summer months, or even taking away on holiday. Not only is the Coolaroo a great choice of raised dog bed, this can provide an excellent outdoor dog bed too. I have already mentioned that the Coolaroo shown above is a popular outdoor dog bed choice, with it’s elevated bed keeping your dog away from the damp ground but still comfy and relaxed. Find out more about the Coolaroo here. The Original Pet Cot is of a very similar design to the Coolaroo shown above. This portable raised dog bed is perfect for keeping your dog cool in the summer. It is easy to assemble and take apart again, so you can use it at home or on holiday. The mesh centre of the bed is designed to be breathable and allow air to flow around your dog, keeping her cooler when the weather is fine. It comes in three sizes, and you will want the largest for a fully grown Labrador. Find out more about the Original Pet Cot here. 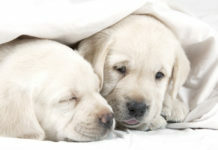 If you find that your dog tends to get chilly in the colder seasons, then you might want to consider a heated dog bed. These are also a good idea if your dog is kennelled at any time during the day and night, for keeping them happy and cosy in bed. The Aspen Self-Warming bed looks like a traditional dog bed, but is made from a material which allows your dog’s body heat to be radiated back. For more information about the Self-Warming bed click here. The Warming Pet Mat is a great choice for keeping your dog snug in their crate or kennel. It doesn’t require electricity as the pad is simply heated in the microwave before use. 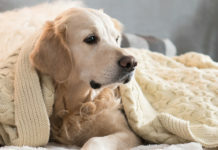 Giving a warm feeling to soothe aches and pains in older dogs, or just keep your Labrador cosy in the colder climate. The other big benefit of this mat is it can also be used for cooling, simply by being chilled in the fridge! So it’s great help all year ‘round. You can find out more about the Warming & Cooling Pet Mat here. Big dogs need big dog beds. 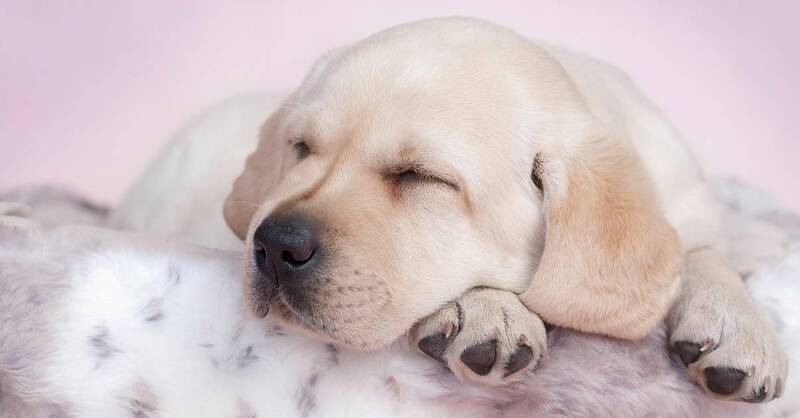 Although Labradors can range in size quite significantly, especially between show and working strains, they are universally fairly large breed dogs. If you find your Labrador just can’t get comfy on a standard sized bed, or you have two who love to snuggle together, then you will want an extra large dog bed for them. The Plush Bumper Dog Bed is a soft and luxurious dog bed, with plenty of padding and support for your dog. It comes in a range of sizes, and it’s extra large option would be perfect for a large Lab who likes a bit of space when they sleep. It also has a handy non-slip base to keep it from moving around when they settle themselves down. The centre pad is removable and can be used as a crate mat if required, and the bed is machine washable. Find out more about the Plush Bumper Dog Bed here. 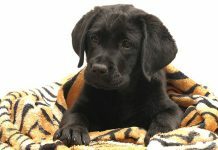 Dog blankets are a great accessory for keeping your dog comfy, but also your home and car clean and intact. Draping a blanket over your car seat or on your sofa can stop those pesky hairs and claw marks, and help you both relax together in the evening. The Big Sky dog blanket is a practical choice. Designed to protect your furniture from stray dog hair and give their somewhere comfortable to snuggle up beside you on the sofa. These blankets are faux suede on one side and soft and silky on the other. For a Labrador you will need to go for the largest size. There are a range of colour options, so you can choose the one that best fits your living room decor – or the colour of your dog! Find out more about the Big Sky Faux Suede dog blanket here. 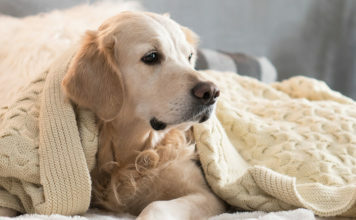 The Solid Pet Throw Blanket is a reversible blanket, giving a choice of two differently textured sides. It is designed to be warm, cosy and very soft. Happily, it is also machine washable. Ideal for keeping your furniture fur free! At 50 x 40 inches, it should fit nicely on most two seater sofas. It also comes in a range of colours, including a tan option ideal for those of you with yellow Labs, and a brown option perfect for disguising those black and chocolate hairs. Check out the Solid Pet Throw dog blanket for yourself here. When our chocolate Lab Rachael was younger she was a dreadful chewer of beds, so she slept for a long time in a durable plastic dog basket for the first couple of years of her life. Our top choice of plastic dog bed for Labradors is the Quiet Time Bed Pod by MidWest. This plastic dog basket is 40 inches long and 28 wide, with sides of 12.5 inches high. It is easy to clean, durable, and has an elevated and ventilated base to help keep the bed fresh. This dog basket can be lined with blankets, or veterinary bedding if your Lab is prone to chewing their soft bedding. Find out more about this plastic dog basket here. Many Labradors, especially those who are under a couple of years old and still in the throws of their destructive phase, spend the night in a dog crate. Fortunately, you can get some very nice dog beds designed just for them. Helping them to feel as happy in their crate as they do out of it. The Premium Synthetic Sheepskin Handy Bed is an affordable and practical option for your crated dog’s bed. This dog mat comes in a range of sizes, so make sure you choose the one that fits best in your dog’s crate to avoid an empty space which he may be tempted to use as a potty over night. It comes in black, white or grey. This dog mat can also be used in the car when you pop out to keep the seats clean and clear. They are built to last, giving durability and comfort as it’s priorities. It is also machine washable, and should fit easily in any washing machine. Find out more about the Premium Synthetic Sheepskin dog bed here. Whichever design you decide to go with – have fun choosing the best dog bed for your Labrador! Why not let us know your favourite in the comments section below? If you want to know what to buy, what to do to give your puppy a great start, and how and when to do it, this is the guide for you! Next articleOne Labrador Puppy Or Two? My great nephew is currently at the San Rafael Guide Dog school getting his 2nd Guide Dog. He needs a dog bed for the new dog. Any recommendations on the best beds and the sources for them? The problem is my nephew’s mother wants me to take it to her home on Thanksgiving, and she will transport the bed to her son’s home. It is too late for me to order on online, so I need a bed I can buy at Petco, Petsmart, or perhaps Bed, Bath, and Beyond. Cheap refers to low quality construction. Inexpensive refers to how much it costs. Sometimes cheaply made items are also inexpensive but not always, and well made items can often be purchased inexpensively. Please watch your use of the word cheap. 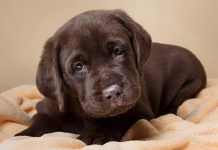 Hi Lucy, Thanks for sharing a complete information about Dog Beds For Labrador and I think it will help all the owners who have Labrador because you have mentioned all the variety which is available in the market according to their size and priorities….nice article….Please write more articles like this. We set out one day to buy an orthopedic bed for our (show) lab. since her knee surgery a few years ago she gotten arthritis in a few of her joints and we wanted her to have a good bed. While we were in the shop, queued up to buy this expensive elegant grey velvety mattress, another customer returned a basic foam filled monstrosity in fake fur leopard print (in its wrapper, her daughter didn’t like it – no kidding) and the serving guy put it on the counter to one side. When we got to the counter and put ours up he made a joke about how much nicer ours was and that they have to pretty much give the other one away – well I’m not silly, he chucked it in for a fiver. We took the queen and the peasant home and I kid you not, there is competition EVERY night for who gets to sleep in the ugly bed. If the big one gets it the little one will squeeze in with her. Beauty is in the eye of the labrador. Both of my dogs seem to prefer the sofa or the floor. That may change as the weather gets colder (we don’t have carpeted floors) but I am making them beds/pads out of some big old pillows we have and canvas-type cloth. Do a search on “burrow beds for dogs” and you’ll find a number of them. Paws and Claws makes a few and Amazon.com sells them, too. I have a 10 year old and a 2year 9 month old labs but the younger one just chews the older ones beds so my older one is suffering all the time he suffers with his hips and I know he is not comfortable in what bed he has left I just Don’t know what to do it is not fair on the older lab. I cannot keep a bed in my 10 month old and 11 month old labs crates. I have spent hundreds of dollars on them and they always manage to rip them to pieces. One was memory foam and I found it in small pieces…..I really think they like to lie on just the plastic liner as that seems to be all that is left when they are done shredding! They get lots of exercise and only go in their crates after a long run…..they get lots to chew on but seem to like to destroy their beds. Maybe I should just wait until they are over their destructive phase….if that ever ends! Ditto from me; My 13 month old Lab has killed 5 or more beds from cheap ones to expensive ones. I have thought about trying the really expensive K9 Ballistic beds, but I would bet that my Lab will destroy that one, too.